Chinese Taipei, Cuba, Mexico, Panama, United States and Venezuela advance to 15U Baseball World Cup showdown. 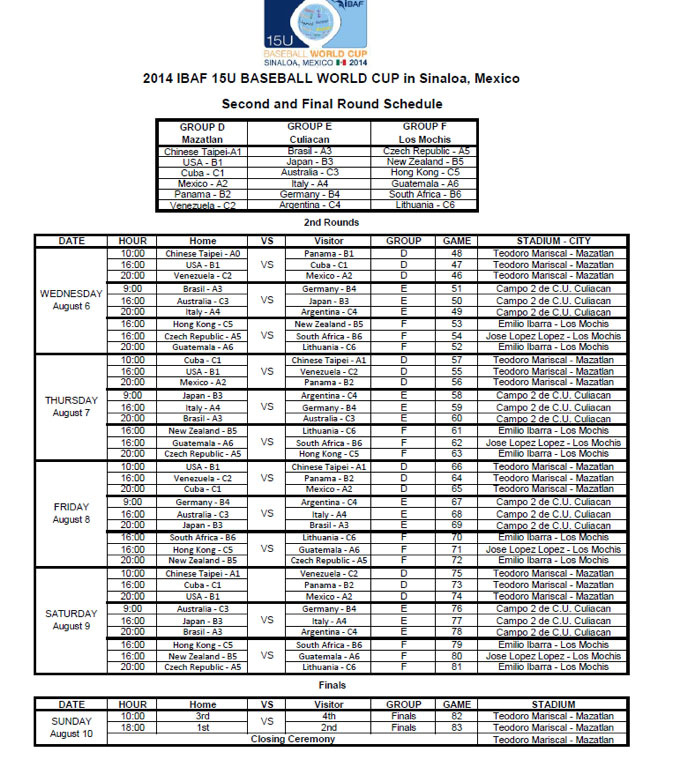 MAZATLAN, Mexico -- The opening round of the 2014 15U Baseball World Cup has concluded, with six of the eighteen participating National Teams advancing to the 'Super Round Robin', which starts tomorrow (6 August) at Teodoro Mariscal Stadium in Mazatlán. The most elite selection of 15-year-old baseball players in the world have been competing for their countries in the II 15U Baseball World Cup -- the highest level of competition in baseball for this age group -- which began on 31-July across Sinaloa, Mexico in the cities of Culiacan, Los Mochis and Mazatlán. After an Opening Round-Robin that consisted of forty-give games in five days, Chinese Taipei, Cuba, Mexico, Panama, United States and Venezuela have emerged from group-play as the six nations that will compete for a place in the gold medal final on Sunday, 10 August. Chinese Taipei won Group A, registering a record of 5-0 versus Brazil, Czech Republic, Italy, Guatemala and host Mexico. Mexico (4-1) defeated Brazil (3-2) in a key heads-up battle on the final day (4 August) of the Round Robin to join Chinese Taipei as the two countries moving out of Group A to the Super Round Robin semifinal. The United States (5-0) defeated Germany, Japan, New Zealand, Panama and South Africa to win Group B with a perfect record of (5-0). World No. 13 Panama (4-1) triumphed over No. 2 Japan (3-2) on the final day of the round-robin to earn a place in the Super Round Robin. 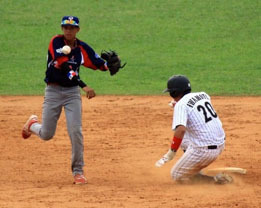 Cuba defeated the defending 15U World Champion, Venezuela -- in addition to Argentina, Australia, Hong Kong, Lithuania -- to finish atop Group C. Venezuela rebounded, (4-1) defeating Australia (3-2) in a decisive match-up to earn Group B's final ticket to the Super Round Robin. World No. 1 USA versus World No. 3 Cuba will highlight Day 1 of the 'Super Round Robin' (6 August); No. 4 Chinese Taipei will play No. 13 Panama, while No. 10 Venezuela takes on No. 12 Mexico. Opening round head-to-head contests (i.e., CUB vs. VEN -- MEX vs. TPE -- and PAN vs USA) will carry over and not be repeated, meaning CUB, USA and TPE will start the Super Round Robin with a record of 1-0. MEX, PAN and VEN will start the Super Round Robin with a 0-1 win-loss record and have to play perfect baseball to make it to the gold medal final. The top two finishers in the 'Super Group', after four days of competition will play for the gold medal on Sunday at 18:00. Games will be broadcast via AYM Sports' six cable channels and online at www.internetv.tv. A bronze medal match will also be played at 10:00 on Sunday. Over the next four days in Culiacan, Argentina, Australia, Brazil, Germany, Italy and Japan will compete against each other to determine 7-12th place classification. Czech Republic, Guatemala, Hong Kong, Lithuania, New Zealand and South Africa will be grouped in Los Mochis to compete for 13-18th place.